We had this same idea. 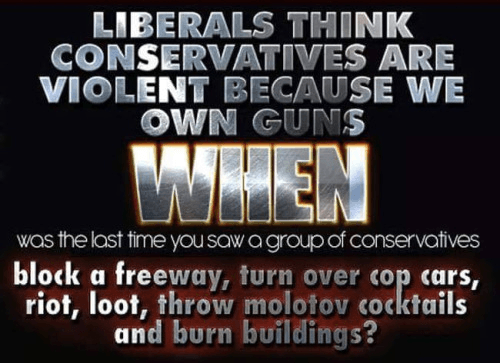 We proposed that, since typically it’s people of the political left who commit gun violence (After all, prisons and gangs are not overrun with bow-tied Conservatives, Republican voters, or members of Young American for Freedom), then maybe we should go for Democrat Control instead of gun control. We proposed an incremental approach, by calling for a ban first on automatic Democrats, then on semi-automatic Democrats. The very first thing we called for was an immediate ban on assault Democrats! That one should be obvious. And easy to accomplish. The ultimate goal would be, of course, full confiscation of all Democrats, as that would, obviously, lead to a near total cessation of gun violence. Needless to say, it was all written with tongue firmly lodged in cheek. But the little assertion above — typically it’s people of the political left who commit gun violence (After all, prisons and gangs re not overrun with bow-tied Conservatives, Republican voters, or members of Young American for Freedom — is food for real thought. One possible conclusion: Far from the presence of guns being responsible for gun violence, it’s the presence of leftism, in its many manifestations, that is at the bottom of all violence*, of which gun violence is just a small subset. * Of course, not all violence, as there are crimes of passion, and crimes of the moment. That will always be true. However, leftist ideology does stand in the dock to answer for its role in the development and growth of things like gangs, inner-city poverty, deteriorating race relations, abortion, and a steady decline in the overall respect and reverence for life itself. These are all things that — absolutely no question about it — lead to violence of all types. Great to hear from you, my friend. I read your response aloud to my wife. She said, “you know, he’s absolutely right.” Your satire is top notch. Your assertion is astounding because it smacks of the truth, and will surely infuriate left-minder thinkers. Thanks for writing and sharing this gem! Thanks, Tom, for your very kind words! Here’s a little thought exercise we did on the topic back in June of last year: Finally! Someone ELSE Spotted It Too! The idea that the root causes of gun violence just might be: the thinking or general mindset, or choices, of the ones actually committing the gun violence is just another example of the painfully obvious being desperately, constantly ignored, in order to further a leftist political agenda. Of course the media bought it too! Lock, stock and barrel. Hence, many Americans now focus their thoughts pertaining to gun violence on … an inanimate object, rather than on: the actual violent people doing the violence. As if somehow removing their guns might make them better people. It’s worth repeating: the actual root cause of violence — of any kind — is the violent person, in whose repertoire of responses to any stimulus, violence has not been eradicated. Please note: I understand that guns allow people to commit a whole lot of violence in a little bit of time. However, the person bent on committing mass violence, and unable to find a gun, will simply use a bomb or the like. You still can’t get away from the fact that the root, primary, obvious cause of violence is: the violent person. All the additional violence today — of all types — comes from the leftism that, as mentioned before, has for decades been causing a general degradation in the respect for the miracle of life. And: gigantic apologies for linking somewhere else. I know it’s rude. However, the target link appears to bolster the core premise in your excellent post. Thanks for the link, quite alright. As I read your totally logical follow up, I wondered if a kindergartener could understand the clarity of your thinking. I do believe the answer is yes. When I was in kindergarten, I once picked up a pebble and threw it at a passing car for the sport of it. I hit it. The car stopped. I got in BIG trouble. My parents didn’t cluck about a need for more pebble regulations, or even more, a total ban on pebbles. They used it as a teaching moment, a lesson which was quickly reinforced by the discipline which accompanied my damaging actions. I have never thrown a pebble at a moving car ever since. Thanks again for your kind words, Tom! I love the pebble-tossing example! A fine 21st-Century parable! You can’t ban dumb… any more than you can fix stupid. What wasnt pretty was the behavior of the women marching the next day. My wife and I have been so saddened by that, especially since we know of many women who attended, or supported the gathering.